Although the season stretches into mid-September, there has always been something of an end of the summer festival feel when Moseley Folk arrives on the city’s doorsteps. Beyond the Tracks may be extending Birmingham’s outdoor music attractions this year and End of the Road may be the higher profile indication of a seasonal closer, but there is a definite uniqueness about the eclectic gathering in Moseley Park across the opening weekend of September. The luscious sloping surroundings of a private park on the hinterland of Birmingham’s city centre coupled with a stage arrangement of non-stop music from the comfort of a single location are key aesthetic features of Moseley Folk. When you blend in a line up ranging from the traditional to the experimental, the sounds that fill the park emanate from a highly crafted pack of artists, musicians and performers. 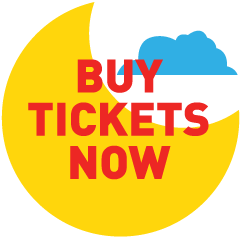 2017 is the twelfth renewal of Moseley Folk Festival and without making too much comparison with previous gatherings, this year’s acts are a pulsating stand-alone selection designed to stretch the discerning cultural ear. The challenge of any preview is to balance out the personal and the general. However, the former immediately jumped out the page when the line-up was announced a few months ago. From an Americana perspective, there a few cooler song writing performers around than the American trio of Courtney Marie Andrews, John Moreland and Shovels & Rope. Memory cannot recall any of these playing the city before, so fans of this particular strand of folk music will be in for a treat. Before leaving the very personal behind, two other names to look out for hail from contrasting lands and places on the musical horizon. New Zealand artist Nadia Reid is an intriguing booking and ear marked as one to catch, while Norwich based singer-songwriter Jess Morgan is firmly establishing a respected foothold on the UK acoustic scene and makes this the second of three planned Birmingham visits this year. It is not unusual for the festival to dip a small toe into the mainstream music world and perhaps the artist who reflects this policy most in 2017 is Friday headliner Amy MacDonald. On an ever-increasing influential footing, but with a slightly left field style is Laura Marling who brings the festival to a close on Sunday. This slot follows in the footsteps of acts like The Proclaimers, The Monkees and The Dubliners from previous years, so a definite diversion to create an alternative vibe. 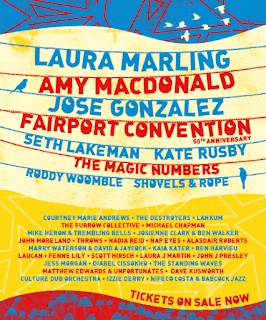 Of course, core folk festival credentials are not too tough to find with Seth Lakeman, Kate Rusby and The Furrow Collective leading the contemporary charge from a traditional angle. If you want to swap the word contemporary for legendary, then look no further than the Saturday evening performance of Fairport Convention, right in the midst of their fiftieth anniversary celebrations. For contrasting styles of the folk spectrum, you could try the celtic tones of Lankum (formerly Lynched) alongside the melancholic tranquillity of Josienne Clark and Ben Walker. 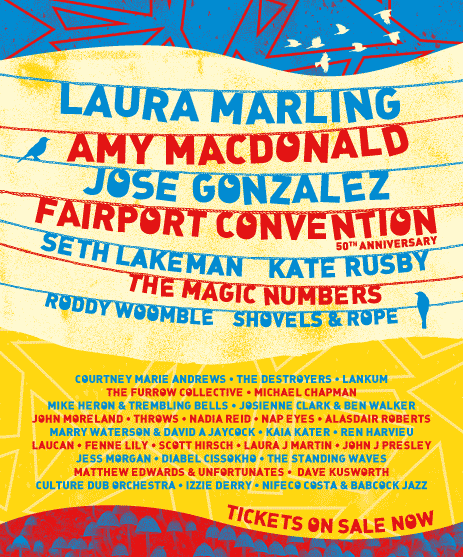 To widen the the appeal by tapping into the circles of experienced artists, the festival has acquired the services of The Magic Numbers and Roddy Woomble. Dedicated fans of both these acts are likely to attend. This will no doubt also apply to Mike Heron who brings an Incredible String Band influence to the stage on Sunday with another city appearance in tandem with Trembling Bells. On the other hand, the name Kaia Kater may not be well known before the weekend, but it wouldn’t be a surprise if her Moseley Festival appearance altered that. Jose Gonzalez returns to the festival after a few years absence and his Saturday evening slot has a good chance of acquiring new fans in a similar vein to what was reported from a previous appearance. Mingling the prior familiar with those that will be at the end of the festival demonstrates the astute skill in programming a line-up that entices on paper and is well set to deliver in presence. Don’t forget the twin stage set up enables a constant stream of fine music from Friday lunchtime to Sunday evening, all for a modest outlay. Also returning this year is the Kitchen Garden curated stage featuring independent artists such as up and coming folk starlet Emily Mae Winters and locally based duo Ashland. All artists featured are scheduled to attend the festival at time of publication and a full list of performers can be found at the event site.